Have you ever fancied being a guinea pig? Go on you know you have! To cut to the chase I’m trying to prove that eating pineapple can reduce the pain, inflammation and swelling associated with arthritis? If you don’t have arthritis don’t stop reading as pineapple can also help with digestive issues such as gas, bloating and other IBS symptoms, blood pressure, circulation, heart health, hay fever and any condition which is inflammation based. The challenge is to eat 200g of pineapple for a two weeks period and to monitor the effects on your health? Unfortunately, I can’t provide you with the pineapple but the upside is that you might discover a yummy drug free solution to help with your symptoms. Also, if I get some favourable results I will mention you in a recipe book that I’m writing on arthritis. If you are interested then more on how I want you to do this later but some quick back ground on my book and how pineapple may be of benefit to you. Pineapple is one of the foods I have included in my book and there is plenty of research to back up health claims in relation to joint health. Most of the studies on pineapple relate to an enzyme found in pineapple called bromelain which has been compared favourably to the anti-inflammatory and pain reducing effects of diclofenac and other NSAIDs but obviously without the harmful side effects. Bromelain has also been found to improve immune function. If that isn’t enough pineapple also contains potent antioxidants such as vitamin C, vitamin A and anthocyanins which may help reduce pain and inflammation by savaging free radicals which are often responsible for cell destruction and joint damage in arthritis sufferers. Furthermore, vitamin C has been found to stimulate collagen and protect against the breakdown of cartilage so huge potential here in assisting the smooth operation of joins generally. As you can see the potential for pineapple is huge in joint health. 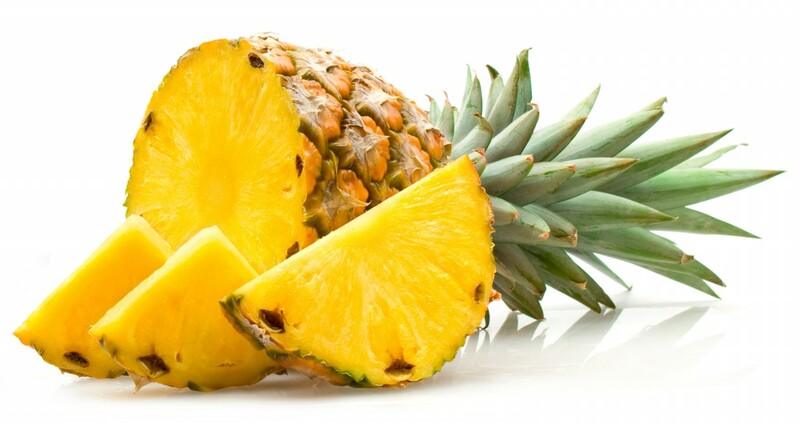 Although there is plenty of anecdotal evidence to suggest that pineapple in its food state can help, the really conclusive evidence is based on extractions of bromelain in a supplement form. So, I thought it would be interesting to put pineapple itself to the test? If you are interested in trying this what I’m asking you to do is to include 200g of fresh, raw uncooked pineapple in your diet every day for two weeks and monitor arthritic symptoms along with the reduction of any other symptoms you might have i.e. gas bloating etc. Please note this has to be fresh pineapple and it needs to include the middle stork bit as this is richer in bromelain than the flesh. Pineapple juice in cartons from the supermarket will not work as its been pasteurized which will render it pretty devoid of nutrients. As the stork bit is quite tough you might prefer to make a smoothie with the pineapple. If you do this be careful what else you mix in as pineapple is quite high in sugar. My suggestion would be to whizz up the pineapple in a blender or a Nutribullet with a celery stick and some fresh ginger. Keep a diary of your symptoms i.e. pain, stiffness, swelling, inflammation, general wellbeing and any other symptoms. Finally, do let me know if you are intending to try this and more importantly let me know how you get on. I would also be interesting in any pineapple smoothie recipes you might come up with? ← Eat hare, it’s December?